The mission: Hearne Family Road Trip. The destination: La Crosse, Wisconsin. The takeaway: Authentic Belgian Waffles and other delightful things can be found in the most unexpected of places. Shortly after arriving at her gorgeous 1950s Frank Lloyd Wright-inspired home in La Crosse, Teresa Westrich mentioned to me that La Crosse is a food desert. Teresa and Andrew Westrich are among the most knowledgeable and passionate foodies I know. Andrew has heavily influenced the growth and sophistication of Mike’s beer collection, and the Westrich clan single-handedly introduced me to wonders like clafoutis and Beaujolais. Teresa told me that they often import ingredients from the Twin Cities that they can’t get in La Crosse, and that they miss the quantity and variety of restaurants available in Minneapolis. Olive Tapenade: Andrew made this incredibly flavorful Olive Tapenade that accompanied some Red Table meats we imported from Minneapolis for lunch. Dairy, Dairy and More Dairy: Andrew and Jim Jarman both moved from the Twin Cities to La Crosse to work for Organic Valley, and the dairy flowed freely all weekend. We enjoyed Organic Valley grass fed milk, yogurt, and a variety of cheeses. Sam and Hannah were in heaven. Hot Beverages: Two items of note here – espresso from a Bialetti and Lapsang Souchong, a smoky black tea. Mind blown. Apple Pancakes: At our Sunday Brunch at the Jarman residence, we enjoyed some seriously good apple pancakes that will soon be making it into our rotation. Yum. In conclusion, I am ready to move to the food desert of La Crosse if it means I get to eat like this every day. The Jarmans and Westriches reminded me that good things can be found anywhere as long as you know how to cook up your own amusements. Thank you to our friends for such an enjoyable weekend! This weekend we celebrated Hannah’s first birthday with an Alice in Wonderland Tea Party. I couldn’t think of a more fitting theme. Sam and Hannah teach me infinite lessons, but one of my favorites is to believe in impossible things. 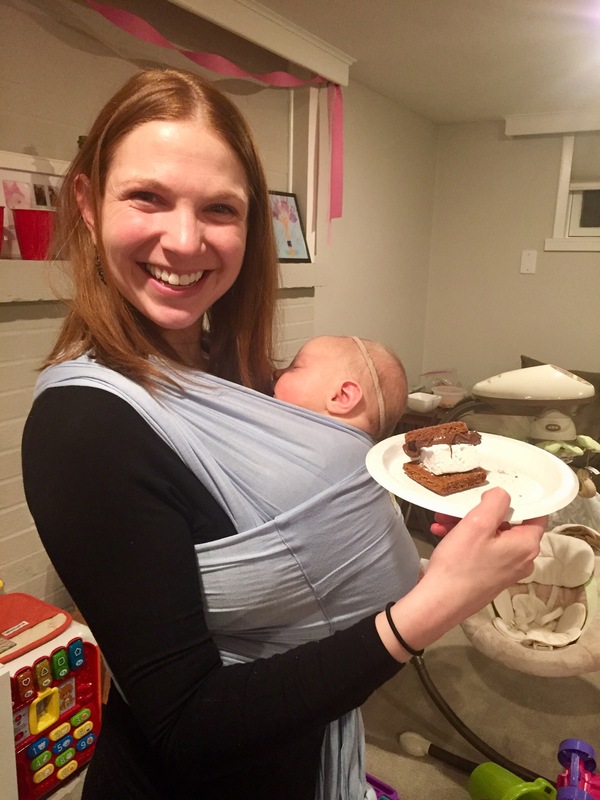 The rabbit hole of parenthood is strikingly similar to Alice in Wonderland… a parallel universe full of adventures, madness, curiosity and growth. Also, what could be cuter than a tea party for tots? This party made all my dreams come true. I have been a long-time fan of illustrator and lady boss Anna Bond, founder of Rifle Paper Company. I was delighted to learn that she illustrated a gorgeous special edition of Alice in Wonderland, and produced a line of fabrics, prints and more to go along with it. Of course, I had to buy all the things. My mother in law Leanne created the most gorgeous table runners for the party out of Anna Bond’s Alice prints. The kids (and grownups) were invited to come to the party in their fanciest frocks and maddest hats. We learned after mailing the invitations that Hannah is terrified of hats. Luckily, our pre-party hat desensitization treatment was effective, and Hannah didn’t have any hat-induced meltdowns. Sam and Hannah loved playing with their friends at the party. In true Hannah style, Hannah was a champ at her birthday party. She tolerated the giant bow and hard-to-crawl-in dress that I made her wear without complaint. She enjoyed exploring her new toys and playing with her friends. But most of all, the girl loved her cake. Smash cake is for amateurs – Hannah ate it like a proper lady, and would have just kept eating forever if we had let her. I owe it all to my mom Jennie and mother in law Leanne. These ladies were nothing short of amazing, working hard to shop, cook and clean before and after the party. Here they are at the end, recovering. Birthday Cake: one of Sam’s teachers’ moms makes cakes, and she created a smashing teapot smash cake on top of a darling Alice birthday cake for Hannah. Happy Birthday Sweet Pea, we love you! Sometimes, Mike and I get excited and over commit. Whether it be three racks of ribs, four challahs, six types of pie or an 18-pound brisket, our freezer and our bank account bear the brunt of our culinary ambitions. Our foodie dreams take over and pretty soon we find ourselves exhausted, knee deep in dishes and a huge pile of culantro leaves. No, that was not a typo. We meant to buy Cilantro and bought Culantro instead. Do you need some? Because we have a bunch. This weekend, Mike realized his dream of a Thai-inspired Superbowl menu. It was loosely inspired by a visit to Lat14 a few weeks ago, where we had an incredible meal that Mike wanted to recreate. So on Saturday, with Hannah as his trusty sidekick in the bucket seat, Mike visited four (Four!) Asian markets to pick up necessities I had never heard of like Nam Prik Pao (chili paste) and galangal (I still don’t understand what this is), among others. Our kitchen got a serious workout Sunday afternoon. Sam and I struggled for creative control over an arduous batch of cupcakes, which we had to pause halfway through to go to the store and buy oil. Meanwhile, Mike peeled shrimp, chopped vegetables and herbs, and made his own stock for the Tom Yum soup. Oh, and he also stir fried some Bok Choy and oven baked some chicken wings which would later get a bath in a mysterious and delicious sticky Asian sauce. And he made some cheese dip, because it was the Superbowl after all. And was it worth it? Absolutely. That soup in particular was one of the most flavorful things that has ever entered my mouth, it was no-holds barred delicious. A less enlightened version of myself may have gotten stressed out about the immense pile of dishes and general destruction that came out of this. But yesterday, I decided to just embrace the chaos and go with the flow. Cooking is a labor of love and creative outlet for both of us, and that is (almost always) worth it. 2018 Recipe of the Year: Gumbo! We have a thing with Cajun food. And by we, I mostly mean Mike. A couple of years ago, he invested in a 60-quart pot so we could host our own shrimp and crawfish boils for the masses. Nearly every Friday, he asks to pick up none other than Cajun food for dinner on his way home from work. And, just when I think we’ve exhausted every video in the Viet-Cajun genre on YouTube, I am again proven wrong. When I step back and think about it, it’s not surprising that Mike has fallen in love with Cajun food. Yes, it’s delicious, super flavorful and unique. But more than that, it brings people together. Whether over a bowl of gumbo or jambalaya, or a table covered in newspaper and strewn with shellfish, potatoes and corn, Cajun food is a connector of people. And so it happened that this year, Mike’s brother Jim has started joining us for family dinners on Sunday nights. One Sunday, Mike made the recipe below, and our lives were forever changed. Never before had we experienced a gumbo so rich, smoky, and deeply full of flavor and soul. Thank you America’s Test Kitchen for bringing this recipe into the world. Note – we also recommend adding shrimp to this… game changer. 2. Heat oil in Dutch oven over medium heat until shimmering. Add onion, bell pepper, and celery and cook, stirring frequently, until softened, 5 to 7 minutes. Stir in thyme, garlic, paprika, bay leaves, cayenne, 1/4 teaspoon salt, and 1/4 teaspoon pepper and cook until fragrant, about 1 minute. Stir in 2 cups broth. Add chicken in single layer (chicken will not be completely submerged in liquid) and bring to simmer. Reduce heat to medium-low, cover, and simmer until chicken is fork-tender, 15 to 17 minutes. Transfer chicken to plate. 3. Slowly whisk remaining 2 cups broth in small increments into toasted flour until thick, smooth, batter-like paste forms. Increase heat to medium and slowly whisk paste into gumbo, making sure each addition is incorporated before adding next. Stir in andouille. Simmer, uncovered, until gumbo thickens slightly, 20 to 25 minutes. 4. Once cool enough to handle, shred chicken into bite-size pieces. Stir chicken and scallions into gumbo. Remove pot from heat, stir in vinegar, and season with salt to taste. Discard bay leaves. Serve, passing hot sauce separately. This was a big weekend for the Hearne household. Feeling ambitious, we attempted potty training and hosting a multi-course Spanish meal in the same weekend. The only casualties were a batch of overcooked garlic and a few pairs of underwear. Yes, Sam took the plunge and wore big boy briefs for the first time. I’d call it a moderate success – there were lots of celebratory, proud moments along with a handful of accidents. The main piece of wisdom I have to impart as it relates to this rite of passage: Don’t pretend to be a grizzly bear on the first day of potty training. One of Sam’s favorite games is to hide in a room or closet while Mike or I come in and pretend to be a big bad wolf, or monster, or grizzly bear. Per usual, Sam, Hannah and I huddled together in the dark closet while Mike came in roaring and bellowing in his best grizzly bear voice. Apparently it was a little too convincing because Sam got scared and it didn’t end well for that particular pair of undies. In spite of potty breaks every 20 minutes, we also somehow managed to host Mike’s parents and brother for a tapas party in honor of Mike’s mom Leanne’s birthday. This was an especially fun meal to make as Mike and I relived our semester abroad in Barcelona. I was reminded that all things Spanish are doused in olive oil and garlic. And, I learned that Smoked Paprika is a magical elixir that makes everything deeply smoky, sweet and enticing. Dessert: It was Leanne’s birthday, after all, and birthdays require cake. So, we deviated from the Spanish theme and made Amy Sedaris’s Cupcakes with Buttercream Frosting and homemade vanilla ice cream on the Chef’N Sweet Spot instant ice cream maker. I’d tell you that the ice cream was delicious and fun to make, but the portions were small and not fully frozen. All in all, I feel like we really achieved something and leveled up on both parenting and hosting by attempting and not totally failing at both of these endeavors in the same weekend. I’ll count it as a win on both accounts. 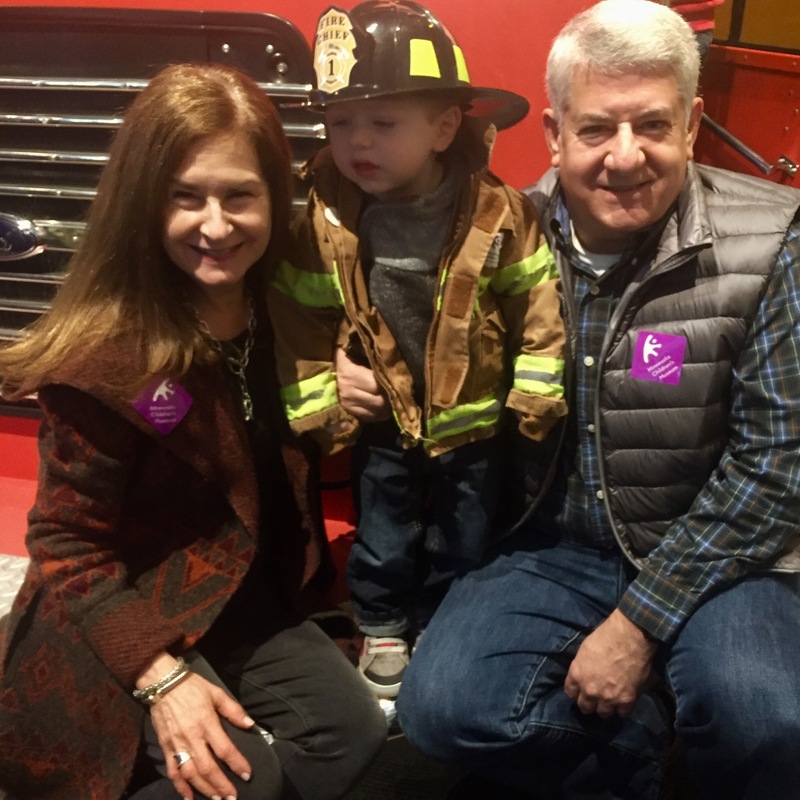 This weekend, my Mom and Dad visited from Kansas City and we lived the Bold North Minnesotan dream. 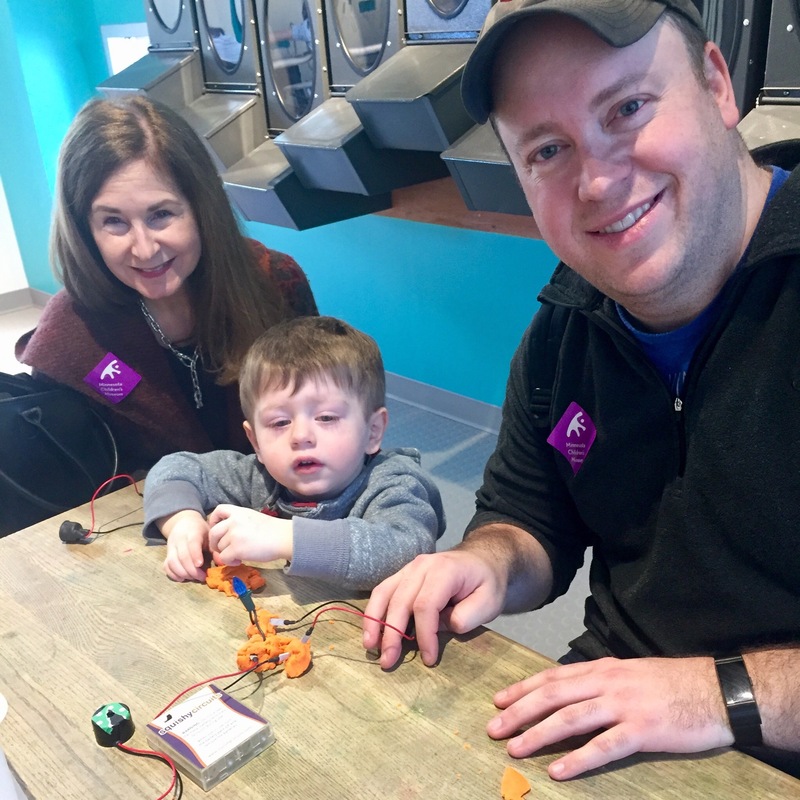 On Saturday, we ventured out in below zero temperatures for a visit to the St. Paul Children’s Museum and the legendary Cecil’s deli. Not to be deterred by the snow, we piled in the car in search of lunch and shopping on Sunday. And, we watched the Vikings come back against all odds to beat the Saints in the game that for one shining moment, made everyone (even me!) into a football fan. 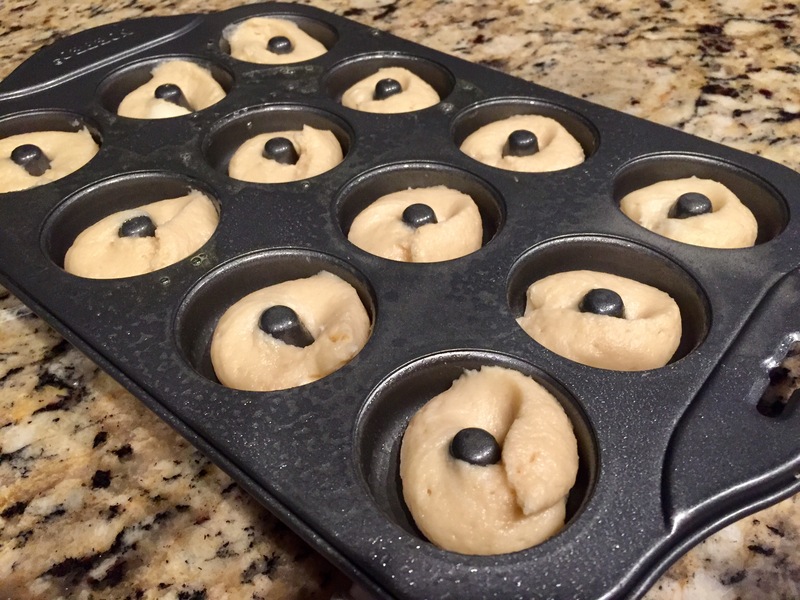 I’m always looking for an excuse to bake, and I wanted to make a Minnesota-inspired treat for the family to enjoy this weekend. I settled on mini donuts for reasons that are obvious to no one. On our way home from Florida this Christmas, Mike and I pulled out our best Mom and Dad jokes and told Sam we were heading to home to Minnesnowta. Sam added his own twist and decided we live in the “mini donut.” From then on, Sam has continued to refer to Minnesota as the mini donut. One of my most memorable mini donut experiences was at Cafe Lurcat on my General Mills recruitment trip to Minneapolis before I moved here. 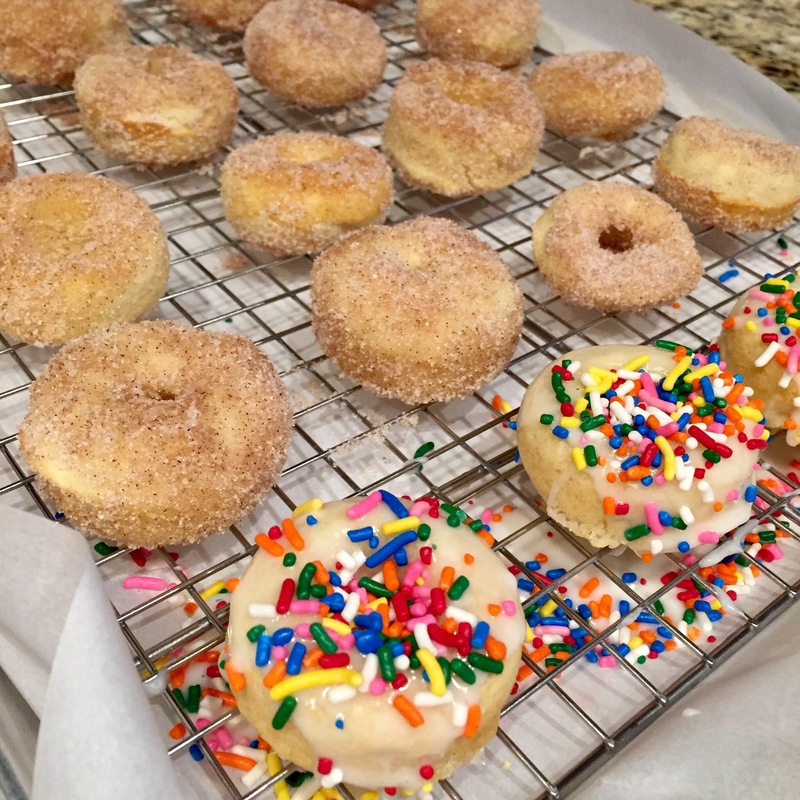 I remember thinking… mini donuts? For dessert? Turns out they knew what they were doing. Ten years later, hot mini donuts are an annual state fair favorite for me and many others, and in my opinion, a true Minnesotan experience. And so, I invested in a pair of mini donut pans. I researched recipes and toppings. 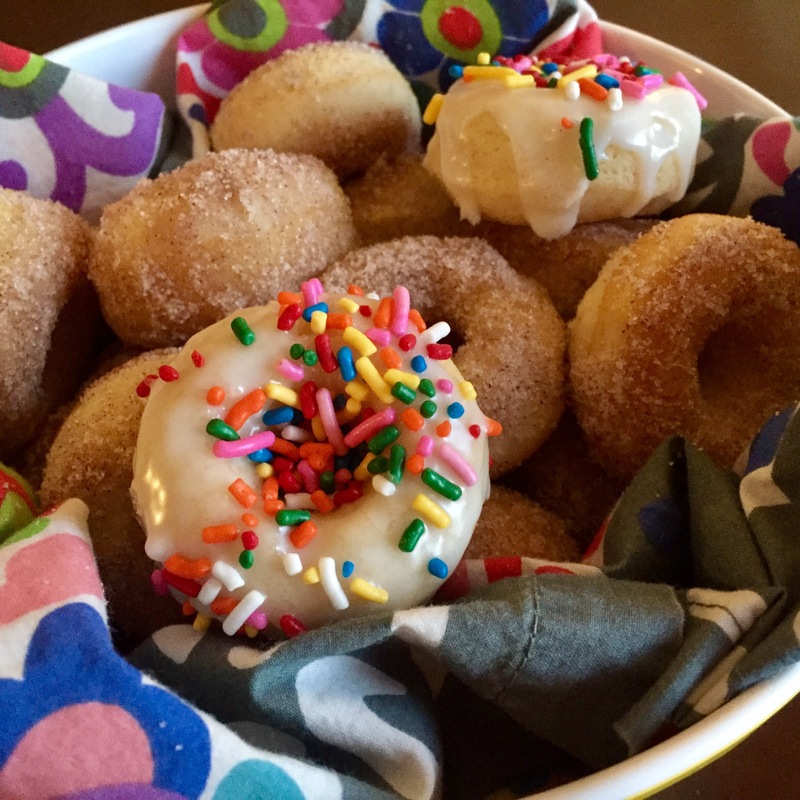 And Saturday at 7:30 AM after watching the entire Lion King movie for the 5th time in five days, Sam and I whipped up a batch of these baked mini donuts from Baker Bettie. These donuts were perfection and made us all very happy. They’re mini. They’re soft and cake-y. And they’re covered in cinnamon sugar or sprinkles… what’s not to like? In celebration of all things Minnesotan, maybe I’ll remake these with yellow and purple sprinkles if the Vikings defy all odds and go to to the Superbowl. But even if not, these little guys will be making many appearances at brunches in the next year. Happy 2018, friends! We rang in the new year Sunday at 4:30 PM with close friends, a throng of toddlers and the output of a 24-hour baking frenzy. Say hello to the Homemade S’more Bar. Approximately 50% of Sam’s diet consists of graham crackers. And what is a graham cracker, exactly? 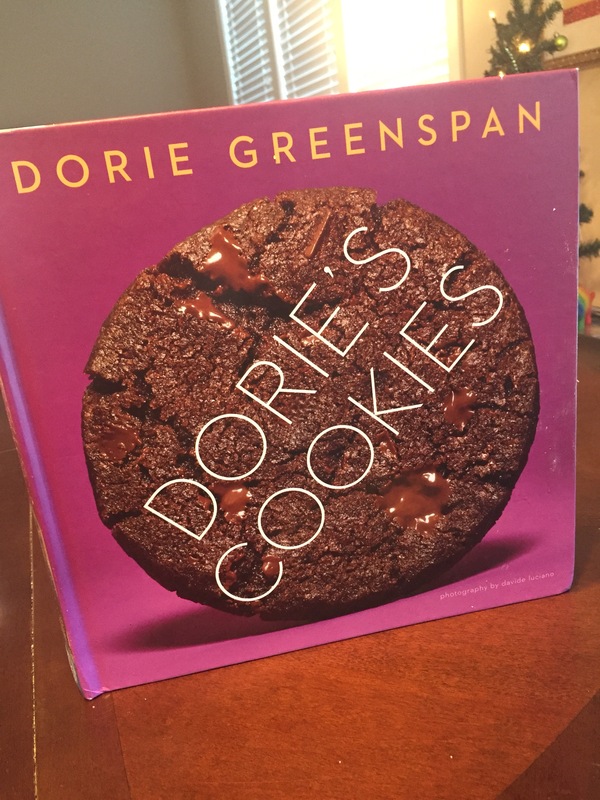 Best as I can tell it’s a cookie that includes just enough whole wheat Graham flour to allow it to pass as a “cracker.” I was thrilled to receive the Dori’s Cookies cookbook from the revered Dori Greenspan as a gift from the Hearnes. I was even more excited to see the recipe for graham crackers and to finally make them for myself. The hardest part of making graham crackers was assembling the food processor. They turned out slightly thicker and less sweet than the store-bought kind. Ultimately, we liked them and I’m glad I made them. 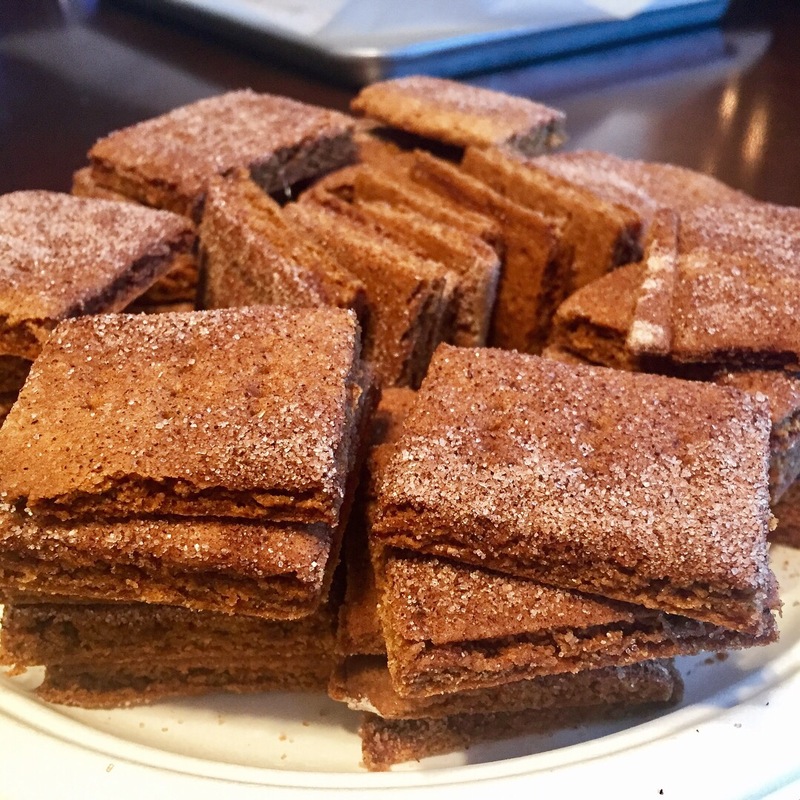 Given the massive quantity of graham crackers we consume, we’ll be sticking to Costco for the bulk of our graham cracker supply. The next component of homemade s’mores were Ina Garten’s Homemade Marshmallows. These. Were. Epic. And totally worth the time and effort – they took 20 minutes and required no baking. 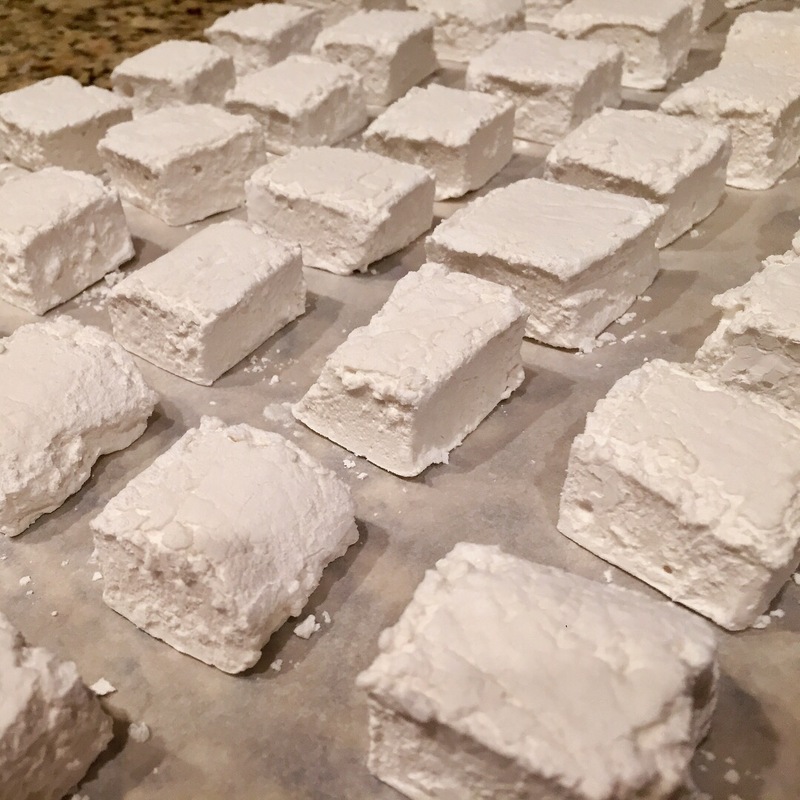 A homemade marshmallow doesn’t even compare to store bought – these were so much more flavorful and delicious. I made vanilla but next time want to experiment with other flavors like caramel, Kaluha, Bourbon, Crème de Menthe, and whatever else I dream up. As any S’more maker knows, the marshmallows are significantly better warmed up. Pop your s’more in the microwave until the marshmallow just starts to puff up and you will be rewarded. 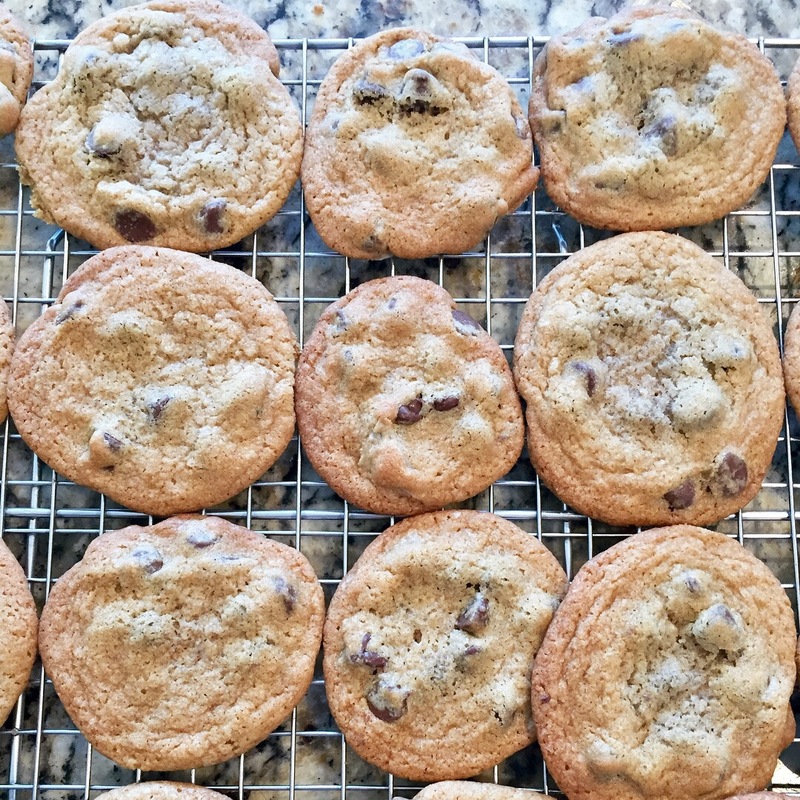 I felt the need to make additional s’more components, and what better than chocolate chip cookies as an alternative to graham crackers. I made half with chocolate and half with white chocolate chips. Key learnings – you can’t go wrong with a chocolate chip cookie as part of a s’more, and toddlers love white chocolate chips. I didn’t tackle making my own chocolate for this project… maybe next time. Instead, we bought a variety of chocolate bars, and some Nutella and Biscoff Cookie Spread to slather on the grahams. 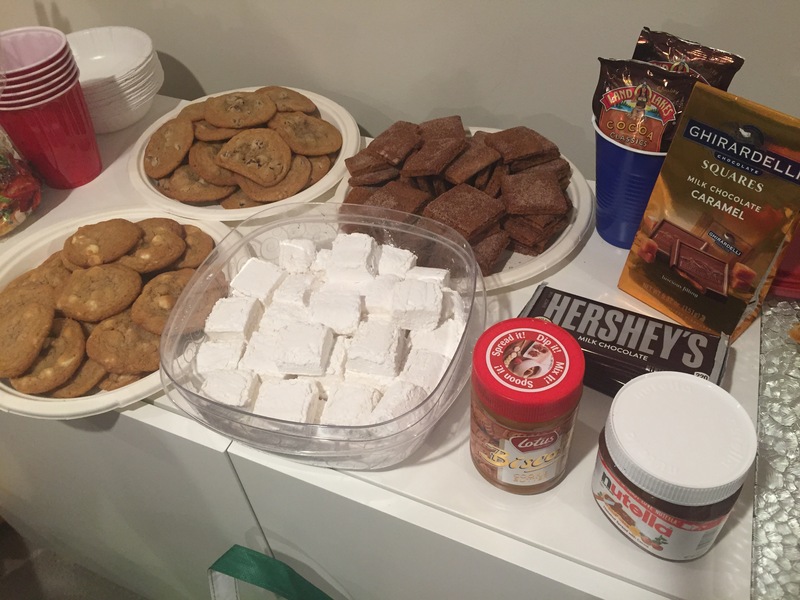 All in all, I would call the S’more bar a success. I think it works well for parties of any sort, summer or winter.